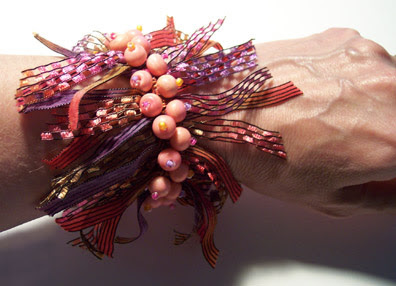 I made this bracelet for a challenge over at the Wearable Arts forum at WetCanvas a couple of years ago, and just unearthed it recently! It was actually inspired by a photograph of a fruit and vegetable market in Seattle. The beads running down the center of the bracelet are the same color as Rainier cherries, which figured prominently in the image, and the ribbon yarn colors reminded me of all the other summer fruit bounty in the photo. I wrote up some tips on making these finger-woven pieces awhile back. 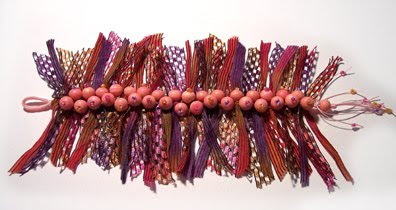 The process for this bracelet was quite similar, except that I used short lengths of ribbon yarn to tie the square knots in between each bead instead of using one continuous length of cord. I love it, but I know I could not wear it. You're not alone...I'm sure lots of people wouldn't be able to stand having the ribbons tickling their wrists!